Her school district had not just gone GAFE (Google Apps for Education) but got laptops that ran the Google dedicated, cloud powered operating system that are known as Chromebooks. If you're not familiar with them (if you are, you can skip past the next couple of paragraphs), Chromebooks have to have very little computer power on the machine itself because most of what a Chromebook does is powered by apps on the cloud. This makes them cheap, with a long battery life and virus/hack resistant. The laptops themselves aren't made by Google but by all sorts of computer manufacturers (HP, Samsung, Dell to name a few) . North American schools are snapping them up at a rate not unlike what we saw with iPads only a few short years ago. But unlike iPads, because Chromebooks aren’t that popular with consumers, their growth in education, for the most part, has stayed out of the media and public consciousness. Just like when iPads were introduced just over 5 years ago, Bridges has committed itself to learn everything we can about Chrome, Chromebooks and GAFE so that we can answer questions like the one above. This piece will deal with connecting switches to Chromebooks but expect other topics in the future including switch powered activities and other alternative access tools on Chromebooks. Using a Bluetooth connected device like the Blue2 switch, (popular with iPads users), will get a switch talking to a Chromebook. You can use the switches built into the Blue2 or connect switches of your choice; there are two input jacks. Just like with iPads, you’ll need to pair the Bluetooth switch interface with your Chromebook, we're using the Blue2 here as an example. 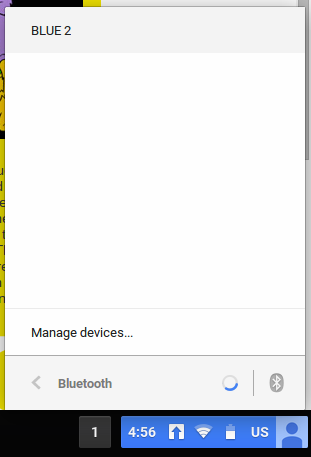 To setup the connection, you’ll have to enable the Bluetooth function in the settings on the Chromebook, (see the screenshot below). Then activate the pairing button on the Blue2 (refer to the set-up instructions that comes with the Blue2) The Chromebook should detect the Blue2 in a few seconds, depending on your Chromebook. Select it and voila! Once the Chomebook has been paired to the switch interface, you’re ready to go! There are different switch modes built into the Blue2 (refer to the Blue2's instructions) to work with different switch software. The Blue2 has 2 default modes with 2 keys for the 2 switches: space and enter; 1 and 3. 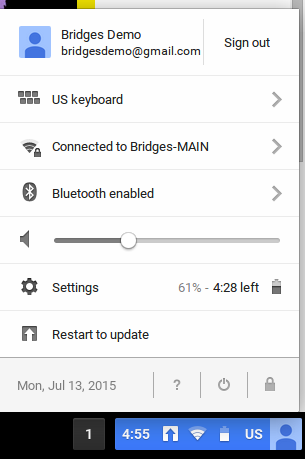 But you can set 3 other user defined modes to any other combination of 2 keys on a standard keyboard. The instructions that come with the Blue2 (also available on Ablenet's website if you lost the quick-start leaflet) walk you through the process. It's pretty easy. You just need a standard USB keyboard to plug into the device to do it. But Chromebooks have USB ports. Can’t we just plug a switch interface into that? Now remember you can’t use your Windows or Mac based software on a Chromebook. Your Chromebook has got it’s own operating system (that’s actually based on Linux) called Chrome. So you can’t use any USB device that will need drivers installed and that includes switch interfaces that need drivers. eg. the Crick Switch Box, the Joycable or Joybox. All great switch interfaces but won't work on a Chromebook. Enter the indefatigable DJ Switch Interface Pro. The workhorse USB connected switch interface that lets you change settings to emulate mouse/keyboard strokes, with no software. We tested the DJ Switch Interface Pro with a Samsung Chromebook, and it worked fine. Plug in a switch to any of the jacks and emulate any of the key/mouse strokes on the DJ Interface. Now all you need is switch activities to run on your Chromebook that the switch interface can actually control. We'll tackle that in the next post.